Happy (Recent) Birthday, Jane Austen! 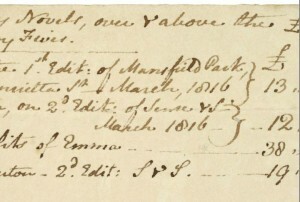 Detail of Jane Austen’s autograph note concerning the “Profits of my Novels, over and above the £600 in the Navy Fives” ca. March 1817. The Morgan Library and Museum. At Ms. Magazine Audrey Bilger (Professor of Literature, Claremont McKenna College) notes that on the occasion of Austen’s birth “Most likely much of the attention will focus on Austen as a writer of romances. Each of the novels concludes in marriage, after all, and the marriage of Elizabeth to Mr. Darcy is a particularly happy ending. We should also pay tribute, however, to Austen’s early adoption of feminist ideals and her insistence that women’s voices and experiences be taken seriously.” Read her account of “Five Feminist Footnotes” to Jane Austen’s work here. At the British Newspaper Archive, Ed King highlights the advertisements and newspaper notices for some first editions of Austen’s novels in the early nineteenth century. The post includes images of the original newspapers (which are normally available only to subscribers). The Morgan Library maintains an online version of its 2010 exhibit “A Woman’s Wit: Jane Austen’s Life and Legacy” which includes images of Austen manuscripts owned by the Morgan, video of luminaries such as Cornel West, Fran Leibowitz, Colm Tóibín, and others describing what Austen means to them, and more.